Member of the Standing Committee of the Political Bureau of the CPC Central Committee, member of the Secretariat of the CPC Central Committee, and secretary of the CPC Shanghai Municipal Committee. 1969-1975: Worked as an educated youth sent to the countryside at Liangjiahe Brigade, Wen'anyi Commune, Yanchuan County, Shaanxi Province, and served as Party branch secretary. 1975-1979: Student of basic organic synthesis at the Chemical Engineering Department of Tsinghua University. 1979-1982: Secretary at the General Office of the State Council and the General Office of the Central Military Commission (as an officer in active service). 1982-1983: Deputy secretary of the CPC Zhengding County Committee, Hebei Province. 1983-1985: Secretary of the CPC Zhengding County Committee, Hebei Province. 1985-1988: Member of the Standing Committee of the Municipal Party Committee and vice mayor of Xiamen, Fujian Province. 1988-1990: Secretary of the CPC Ningde Prefectural Committee, Fujian Province. 1990-1993: Secretary of the CPC Fuzhou Municipal Committee and chairman of the Standing Committee of the Fuzhou Municipal People's Congress, Fujian Province. 1993-1995: Member of the Standing Committee of the CPC Fujian Provincial Committee, secretary of the CPC Fuzhou Municipal Committee and chairman of the Standing Committee of the Fuzhou Municipal People's Congress. 1995-1996: Deputy secretary of the CPC Fujian Provincial Committee, secretary of the CPC Fuzhou Municipal Committee and chairman of the Standing Committee of the Fuzhou Municipal People's Congress. 1996-1999: Deputy secretary of the CPC Fujian Provincial Committee. 1999-2000: Deputy secretary of the CPC Fujian Provincial Committee and acting governor of Fujian Province. 2000-2002: Deputy secretary of the CPC Fujian Provincial Committee and governor of Fujian Province (1998-2002 Studied Marxist theory and ideological education in an on-the-job postgraduate program at the School of Humanities and Social Sciences of Tsinghua University and graduated with an LLD degree). 2002-2002: Deputy secretary of the CPC Zhejiang Provincial Committee and acting governor of Zhejiang Province. 2002-2003: Secretary of the CPC Zhejiang Provincial Committee and acting governor of Zhejiang Province. 2003-2007: Secretary of the CPC Zhejiang Provincial Committee and chairman of the Standing Committee of the Zhejiang Provincial People's Congress. 2007-2007: Secretary of the CPC Shanghai Municipal Committee. 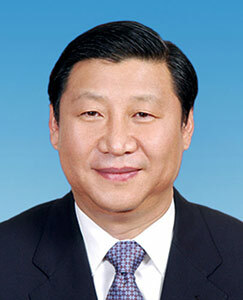 2007-2008: Member of the Standing Committee of the Political Bureau of the CPC Central Committee, member of the Secretariat of the CPC Central Committee, and president of Party School of the CPC Central Committee. 2008-2010: Member of the Standing Committee of the Political Bureau of the CPC Central Committee, member of the Secretariat of the CPC Central Committee, vice president of PRC and president of Party School of the CPC Central Committee. 2010- : Vice chairman of the CPC Central Military Commission. Alternate member of the Fifteenth CPC Central Committee, and member of the Sixteenth CPC Central Committee. Member of the Seventeenth CPC Central Committee, member of the Political Bureau and its Standing Committee, and member of the Secretariat of the Seventeenth CPC Central Committee.